According to a new screenshot posted today, AT&T is gearing up for the to-be announced iPhone 4S! The screenshot comes from the folks over at Engadget. Technically, it’s not a screenshot, it’s more a photograph of a screen taken by a camera but, anyway, it shows the “iPhone 4s White” listed under Model Version in AT&T’s internal system. There are a couple of things I’d like to talk about: firstly, the model is called ‘”iPhone 4s White” instead of “iPhone 4S White”. Remember the iPhone 3GS? Well, the ‘s’ was capital. So, if Apple does indeed introduce a low-end next generation iPhone – as suggested by multiple reports – it will be an iPhone 4S. Secondly, the screenshot comes from Engadget – one of the world’s biggest blogs dedicated to covering consumer electronics. They really never publish anything unless and until it comes from a reliable source. This photo, then, we believe, may really not be fake. Judging from the clandestine screenshot you see above, it most certainly seems like that’s the case. 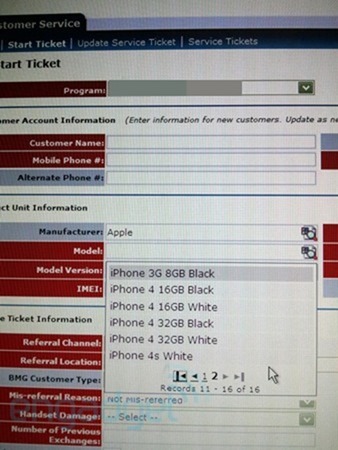 A helpful tipster sent us this tasty morsel, from AT&T’s internal system, listing the "iPhone 4s White" beneath a handful of already familiar Apple handsets. Could it be? Is Cupertino actually planning on bringing a white version of its next iPhone out at launch? We’re afraid only time will tell. This has us thinking, though. If AT&T does have the iPhone 4S in their system, where is the iPhone 5, then? Shouldn’t iPhone 5 be then included in the list too? Perhaps, this is a hint. A hint that the iPhone 5 has been delayed, much like 9to5Mac earlier reported. There are rumors of an Apple media event being held on October 5th to announce “new hardware”. This “new hardware” is expected to be an iPhone 4S and/or iPhone 5 along with a 3G-ready iPod touch 5G. iPhone 4S and/or 5 is expected to be both announced and launched next month. You should know this news that many of the online manufacturer factory uｎｌｏｃｋ providers are giving strictly avoidable phone uｎｌｏｃｋing methods which can make almos most of the phones to be barred in a pair weeks as a result of its uｎｌｏｃｋed. Always attempt to use a reliable uｎｌｏｃｋer like ATTIPHONEuｎｌｏｃｋING or iphoneunloc-breeze. I am aware the most trustworthy site for սոⅼοсking AT&T phones, it’s just google atttiphooneuunlocking, when you have devices l0cked to AT&T, go check it out, we are able to ՍΝᏞΟᏟΚing the newest 6S and 6C as well.